Fayette County K9 Kolt is stepping in for retiring K9 Lobos. 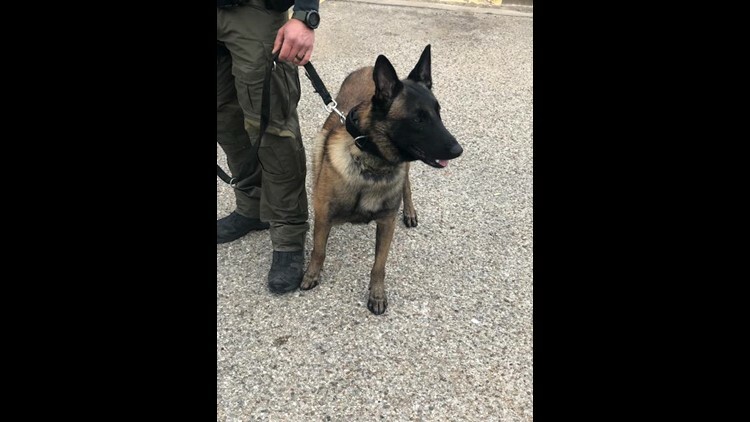 FAYETTE COUNTY, Texas — A warning to drug dealers and cartels: there’s a new dog in Central Texas ready to take drugs off the highways. I-10 is one of the busiest drug corridors in the country and for years, Fayette County Sheriff’s Office K9 Lobos and his handler Sgt. Randy Thumann have worked together to seize tens of millions of dollars worth of drugs and cash. In fact, The Fayette County Record estimates Sgt. Thumann and Lobos kept approximately $2,520,000,000 worth of drugs off of American streets throughout Lobos' career. Now, Lobos is retiring and a new K9 is working with Sgt. Thumann. Kolt, a 16-month-old Belgian Malinois, is already making a name for himself. New K9 Kolt takes over for Lobos in Fayette County. Kolt has big paw prints to fill. Lobos and Sgt. Thumann were somewhat of a celebrity duo in the seven-plus years they worked together. At one point, Sgt. Thumann held the record for the single largest methamphetamine seizure on a highway in the nation, totaling 130 pounds. "I-10 is probably one of the largest drug corridors in the country. It comes directly from the source to one of the biggest hubs: Houston,” Sgt. Thumann explained. Lobos and Sgt. Thumann also tracked down missing kids and hiding criminals. But it was time for Lobos to retire, and once a K9 retires, they become property of the handler. "He's not depressed, you know, he's always in a good mood. He's really social and a really loveable dog,” Sgt. Thumann said. "He's just going to live a retired life. He's comfortable, he's well taken care of and he has a lot of room to enjoy himself." It's a well-earned retirement, to say the least. But for Sgt. Thumann, the work never stops. Now, he has Kolt by his side making one find at a time.